Fractured Scalding Tarn enters the battlefield tapped. Mick, the Bloodhound must be blocked if able. No one's quite sure which side of the law he's on, and no one's brave enough to ask. When Overgrowth Observer enters the battlefield, search your library for a basic land card, reveal it, and put it into your hand. If Overgrowth Observer is heterozygous, put that land onto the battlefield tapped instead. Then shuffle your library. When Gilded Golem dies, create two colorless Gold artifact tokens with "Sacrifice this artifact: Add ." , Exile Gilded Golem from your graveyard: Draw a card. From talent comes money. From money comes power. From power comes the knowledge to rule the world. Last edited by ParadOxymoron on Thu Nov 08, 2018 10:01 pm, edited 1 time in total. As long as Eight-and-a-Half Knives is equipped, it has first strike. 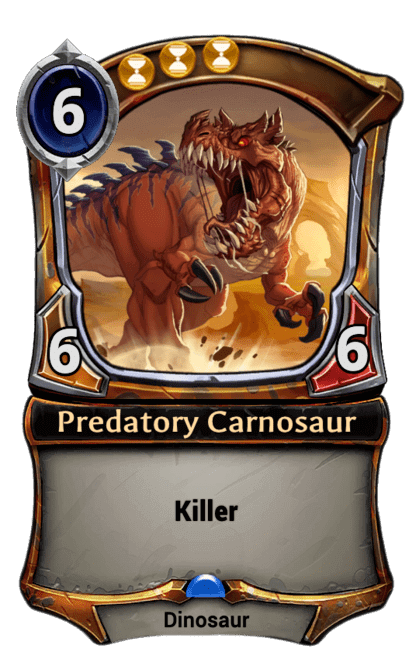 Whenever Eight-and-a-Half Knives loses first strike, you may have it deal 1 damage to target attacking or blocking creature. Wouldn't a more direct translation cost ? Whenever you cast an instant or sorcery spell, if its converted mana cost is less than or equal to Professor Graytail's power, copy that spell. You may choose new targets for the copy. "Oh, I know this one." "At last we meet. Unfortunately, we have little time to get acquainted, as you will soon be dead. It's nothing personal, of course. Your death simply serves my plans. What plans, you say? Well..."
Oops. Yeah, it would. It would also need a way to let it activate around summoning sickness. Coming Storm deals 3 damage to any target. Omen — You may reveal this card as you draw it. When you do, it deals 1 damage to any target. Piety - Whenever you cast a creature spell with in its mana cost, you may have it enter the battlefield with a +1/+1 counter on it for each in its mana cost. Whenever Sultai Sidewinder deals combat damage to a player, target creature an opponent controls gets -1/-1 until end of turn. I don't like that this ability does basically nothing on its own, but Q is a hard letter. Return all creatures without Flying to their owner's hand. Whenever Amphin Cutpurse deals combat damage to a player, draw a card. , Sacrifice a creature: Corpsewheel becomes a 5/5 black artifact creature until end of turn. Threshold - As long as seven or more cards are in your graveyard, Corpsewheel is a 5/5 black artifact creature. Whenever one or more creatures attack you, you may untap all creatures you control. If you do, creatures you control block this turn if able. Whenever Bonebreaker Broker deals combat damage while it's vested, that player discards a card.